Ah, the Glory of Daffodils! 1972 Daffodil Parade. Close-up of prize-winning St. Regis Paper Co. float. A bouquet of giant daffodils is the focus of the float, seemingly much larger than the attendants waving to the throngs waiting on Pacific Avenue. 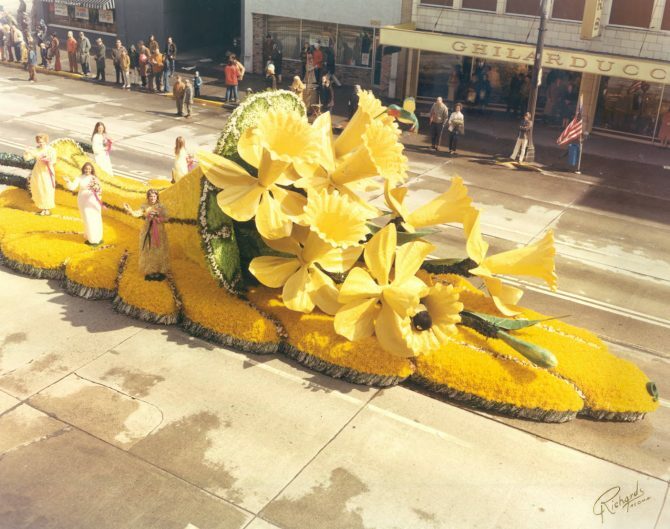 St. Regis was a perennial winner in the Grand Floral Parade; in 1972, it won the Mayor's Trophy for best use of daffodils.